Siechem Madurai Panthers stormed to their second consecutive win in the 2018 Sankar Cement-TNPL as they defeated Jones Tuti Patriots by seven wickets at the NPR College ground in Natham (Dindigul) on Sunday, July 22. After restricting Tuti Patriots to 165/5, Madurai Panthers’ batsmen handled the chase extremely well and dominated the star-studded bowling line-up of Tuti Patriots to complete a comfortable win. 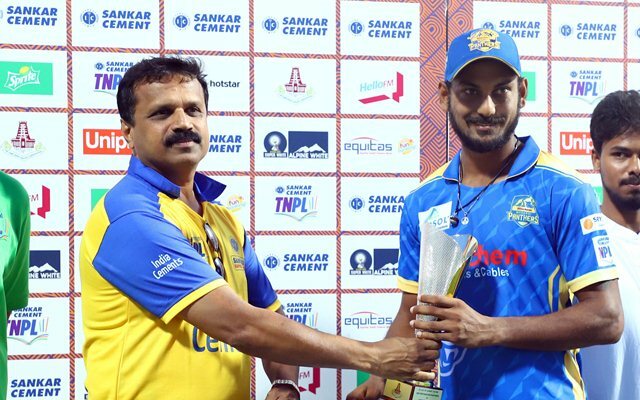 Captain Rohit Damodaren scored an aggressive 28 (20b, 2×4, 1×6) while his opening partner KB Arun Karthick scored a magnificent 59 (42b, 3×4, 4×6) to set the tone for the chase. Shijit Chandran 29 (23b, 2×4, 1×6) and J Kousik 38 n.o. (22b, 3×4, 2×6) helped seal a memorable win. Earlier, Madurai Panthers were equally impressive with the ball. Patriots lost a wicket in the Powerplay for the first time in three matches when Abhishek Tanwar removed in-form Kaushik Gandhi (11) in the third over. Left-handed opener S Dinesh tried to speed up proceedings with a 35 (29b, 5×4, 1×6) but Madurai Panthers’ bowlers had things under control. The third-wicket partnership of 69 (46b) between Anand Subramanian 42 (29b, 3×4, 1×6) and Akshay Srinivasan 44 (35b, 1×4, 3×6) and a late onslaught by R Sathish 24 n.o. (10b,3×6) lifted Tuti Patriots to their final total. Tuti Patriots had won their previous two encounters comprehensively. Madurai Panthers, who began the tournament with a loss, now have two wins from three matches. Jones Tuti Patriots in 165/5 in 20 overs (Anand Subramanian 44, Akshay Srinivasan 42, S Dinesh 35, Abhishek Tanwar 3-28) lost to Siechem Madurai Panthers 166/3 in 18.4 overs (KB Arun Karthick 59, J.Kousik 38 n.o., Shijit Chandran 29, Ganesh Moorthi 1-22).